Delirium Tremens: "That's what the product engineers at the Swiss movement company ETA called their frantic scramble to develop the world's thinnest watch, the Delirium. When they'd finished their work, in January 1979, they had something that must have inspired a few hangovers- a quartz watch that was a remarkable 1.98 mm thin. 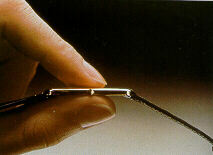 It was the thinnest watch in the world. The Delirium was an achievement, all right, but why the nervewracking, heart-palpitating urgency that earned the project its nickname? That's simple. It was wartime. Thin Watch wartime. Ever since the Japanese firm, Seiko, had introduced the first quartz watch in 1969, Japanese companies had had the lead in quartz technology. The Swiss industry was slow to convert to quartz-watch production, and had almost died as a result. By the late 70's, though, Swiss companies were fighting back on the quartz front, and anxious to prove that they could make quartz movements as well as anyone. The best way was by making extremely thin quartz watches, because with quartz movements, as with mechanical ones, thinness is the hands-down proof of a manufacturer's finesse. Furthermore, consumers loved the slim contours that quartz movements made possible; for decades they'd been snapping up the thinnest mechancial watches they could find. So in 1978, when Citizen and Seiko came out with quartz watches that were 4.1mm and 2.5mm thin, respectively, ETA had to respond. And fast. Its new movement was ready in just a few months. 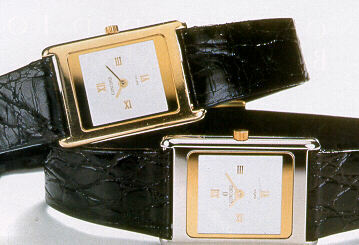 Three watch brands, Longines, Eterna and Concord, used it in their watches, but only Concord sold them in this country. The chief reason the Delirium was so skinny was that the movement had no main plate. Instead, the watch components were fitted into the case back. It was an ingenious idea, one ETA used later when it designed the Swatch. And it meant victory for ETA in the Thin Watch War. Although Seiko parred with an even thinner watch, ETA fought back with three that were skinnier yet. The last, called the Delirium IV, was an amazing .98mm thick, so delicate it could not be worn because the case would bend when you strapped the watch to your wrist.